Seated at the middle: Bai Baubang Mauyag, a centennial Maguindnaaon ‘pababayuk’ (poet), with her forefather Sultan Namil’s graveyard at the background. A prominent example of Maguindanaon folk speech is the bayuk, or alternatively, bayok (lyric poetry). Bayuk also refers to a Maguindanaon chant which is syllabic and tetrachordal. As the Maguindanao language is metaphorical, whenever extra care is needed to express a feeling, it is done through bayuk. Nowadays, there has been a diminishing number of Maguindanaon ‘pababayuk’ (bayuk-reciters) who could spontaneously compose bayuk or know them by heart. 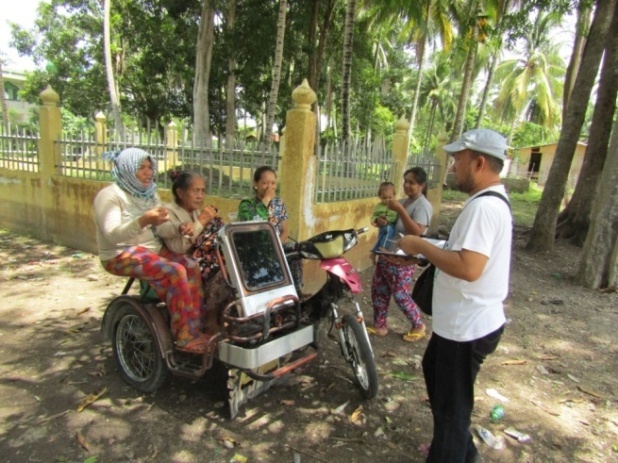 One of these remaining ‘pababayuk’ is Bai Baubang Mauyag of Barangay Bagumbayan, Municipality of Kabuntalan, Province of Maguindanao. According to her estimate when I interviewed her in May 2018, she is almost a hundred years old, and a descendant of Sultan Namil of the Rajah Buayan whose graveyard is also near her house.